What is happening right here in the middle of Valentine season? Well, I am happy to report that I am a new member on the Christmas Stampin' All Year Long design team. Twice a month - on Friday's the team will deliver a challenge to you and I'll get to share in that fun. AND, I'll have lots of Christmas cards already made when December rolls around. You can too, if you play along each time. 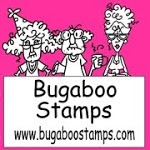 My image is called Christmas Girl Presents and is from our sponsor this week - Bugaboo Stamps. This just happens to be one of my favorite digi stamp companies. And they are giving away seven digis of your choice. Our theme is ANYTHING GOES, so get to creating and link up your creation at the Christmas Stampin' All Year Long blog. You just might win!! You have until midnight February 17th to link up. Have fun and I'll see you over there.